For many years it has not been necessary to design and build your own ducted fan unit. The market is chock full of computer optimized designs for both internal combustion engines and electric motors, using some of the most advanced materials for construction. However, there was a time just a few decades ago that ducted fans were the purview of a few talented and motivated do-it-yourselfers that help to advance the state of the art to where it is today. 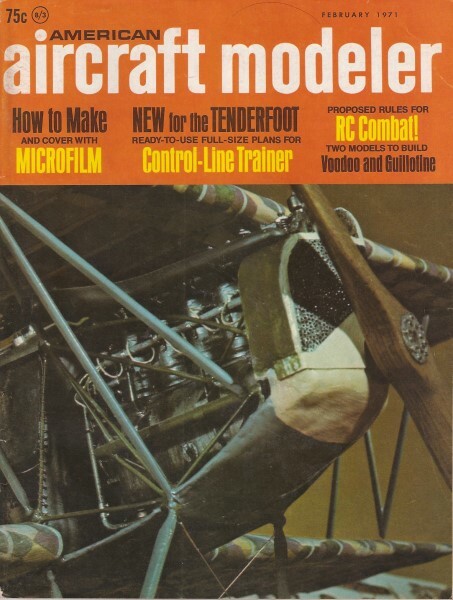 This article, extracted from the February 1971 edition of American Aircraft Modeler, is one of the earlier treatises on the subject. To be useful, these piston-driven air pumps require careful design, testing, and adjusting. THE ADVENT OF THE JET airplane presented a serious challenge to the scale modeler. How could it be duplicated in model form? Obviously, hanging a model engine/propeller combination on the nose of a scale model jet airplane will make it fly, but it certainly detracts from the appearance and defeats the intent of scale modeling, i.e. to duplicate, to the maximum extent possible, the features of the full-size airplane. Model jet engines, at least those that are presently available to the average builder, are terribly noisy, generate fantastic amounts of heat and, in general, are hard to handle. The ducted fan propulsion system has evolved as a result of the requirement to simulate jet propulsion in a model aircraft. Simply stated, the ducted fan system generates thrust by accelerating an air mass and ejecting it through a simple nozzle. Power is applied to the air mass by means of a multi-bladed fan rotating in a duct or shroud which fits closely around the fan. Fan efficiency is improved by the close shrouding of the fan which reduces airflow losses around the tips of the fan blades. The ducted fan is in essence an "air pump." (1) Poor Maintainability: In almost every case, the engine and fan combination is built into the airplane during the early stages of construction and, thus, is essentially inaccessible for normal maintenance, cleaning, or servicing thereafter. (2) No Performance Guarantee: The builder has no way of knowing, until after the model is built, that the proposed engine/fan combination will provide the required thrust. (3) Non-Interchangeability of Parts: If more thrust/power is required (see item 2), the builder is forced to disassemble the model, to some extent, in order to replace the engine (see item 1). In addition, the power unit is not easily interchangeable between models. (4) Improvement Required in Fan Design and Construction: Sheet metal fans are frightening! A blade failure at 15,000 rpm plus, can be disastrous to the operator, the model or a spectator. Proper shrouding helps but sheet metal exposed to vibration is notorious for developing fatigue cracks. Evaluation of the above deficiencies resulted in the development of the ducted fan power package presented here. We have attempted to eliminate the disadvantages and difficulties encountered in ducted fan construction. The power package is constructed using a metal can or appropriate tube as the basic unit. Plywood "spiders" support the engine in the center of the can. These supports also form the basic frame for the airflow straighteners which are essential for good performance. The fuel tank is mounted behind the engine and is faired in by using balsa block. Rear of five-in. unit shows streamlined, fuel-proofed rank fairing. Leading edge of flow straighteners is opposite fan blade angle. The entire engine/fuel tank/flow straightener assembly is assembled as a complete unit prior to installation in the can (see sketches). The power package can be mounted on a test block and thrust-checked by using a cardboard tailpipe of the same dimensions as those to be used in the model. When the thrust output has been verified, the model can be designed around the dimensions of the power unit, with reasonable assurance of good performance. The first step is to determine the fan diameter. Regardless of the size desired, the same basic design procedure will apply. Experience has shown that fans of less than four-in. diameter do not produce sufficient thrust for anything except a lightweight free flight model. Extensive testing indicates that a six-bladed fan with a hub diameter 50% of the fan diameter performs exceptionally well. The blades are mounted on the hub at a 45-degree angle to the plane of rotation. The blade chord should be such that the sum of the chords of the six blades at the hub does not exceed the circumference of the hub. However, this generally provides a blade with a chord wider than necessary for the rpm's at which models will be operating. The fan would be excessively loaded, therefore, 75% of the figure obtained above works well for blade chord. Two methods of fan construction are shown. The first method, which uses plywood blades pinned into slots in a laminated plywood hub, requires the builder to carefully carve the twist into the blades. Twelve to fifteen degrees twist, resulting in a blade tip angle of 30 to 33 degrees, is desired. The amount of twist available will depend on the thickness of the blade material. The second method, stacking the fan profiles, permits the builder to easily obtain the desired twist angle. Either method requires careful but not difficult work. "Resorcinal" glue is used to fabricate the fans regardless of which method is used. Aluminum fans have been constructed using a turned-aluminum, slotted hub with pinned sheet aluminum blades, but their weight far exceeded any expected thrust increases. The extended fan hub is simply a turned balsa block affixed to the basic fan assembly. Do not delete the hub since it helps to establish airflow into the fan blades-especially at the root of the blade. four-in. fan - beef stew.) Examine the can carefully for dents or other defects. Buy the stew and heat and eat the contents or throw them away. Carefully remove the top and bottom of the can so that the stiffener rings (ends) are not deformed. If a fan larger than four-in. is required and a suitable can is not available, several alternate solutions are possible. Rolled 1/16" sheet aluminum with the seam welded and then filed away or a plywood "can" as shown in the sketches will do the job nicely. The can is the heart of the unit and extra care in the fabrication of this item will pay dividends later on. The first step in method number one is cutting several disks from plywood, then laminating them to provide a hub of the required thickness. After the glue has set, chuck the hub in a ¼" electric drill and with a wood rasp or sanding block true up the assembly. Next mark the hub for the blade slots. Make up a template to insure that all slots are exactly the same angle on the hub. Plan to make the slots deep enough so that after the blades have been inserted, the hub and blades can be drilled for ⅛" or larger dowel pins. These pins are insurance that the blades will not separate from the hub at high rpm's. After the assembly has been glued up and is thoroughly set, file, carve and sand the airfoil into the blades as shown. Keep leading and trailing edges sharp and the back side of the blade flat. A simple convex shape to the front face of the blade will do nicely. Method number two for fan construction involves stacking up a series of plywood profiles to the desired hub thickness. Stagger each successive profile until the required root and tip angles are obtained. The proportions shown in the sketches should establish the width of the blade elements adequately to insure that sufficient material is available to obtain the required air foil Note that this method provides a blade which has a wider chord at the tip than at the root. However, with the more effective twist obtained, the blade tip angle is more favorable and the increased chord should be handled easily. The fan must be carefully and critically balanced, and must run as true as possible. Balance may be achieved by drilling holes into the back of the hub, but don't get carried away. Do not establish the final fan diameter until ready to mount the engine assembly in the can. The closest possible running fit is most desirable. Properly constructed, the fan will be close to perfect balance to begin with. An extra coat of clear dope on one or two blades may do the trick. The engine mount consists of a forward and aft plywood spider (¼" or thicker) and a pair of hardwood engine bearers. Saw out the spiders, leaving their legs slightly longer than required. Slip them over the engine bearers with the engine on the rails so that any trimming requirement for engine clearance can be determined. Once the correct positions of the components have been established, mark, drill for dowel pins and engine mounting bolts and epoxy the whole assembly together, with the engine in place. Fuel-proof all interior surfaces of the mount assembly and make certain the engine mount bolts will not loosen under vibration. Trim the ends of the spider legs for a slip fit into the can. The engine crankshaft must be centered. It may be necessary to remove the cylinder head. Small balsa blocks or curved sheet balsa panels are used to fair the engine into the center body of the mount. Cut a hole under the engine to vent off crankcase heat and excess fuel or oil spillage. Don't forget fuel-line access holes. Having faired the center body, next cut inserts from balsa of appropriate thickness to fit between the forward and aft spider legs and up against the center body. Build up a curved leading edge on the forward spiders to form an angle of approximately 20 degrees to the chord of the flow straightener and opposite the direction of fan rotation. These serve as lead-ins for the rotating airflow leaving the fan. The desired 20-degree angle should be available at the outboard end of the straightener and may be reduced closer to the center body, If the size or construction of the unit cannot provide this curved leading edge, simply round off the leading edge of the spider leg, favoring the direction of the rotating airflow off the fan. The aft spider legs are faired by using trailing edge stock of appropriate thickness - ¼" or ⅜". Install, keeping the 90-degree edge on the side of the flow straightener which meets the rotating fan airflow. Observed in cross section, the flow straightener should look like a crude air foil. Fairing the fuel tank is up to the individual. A little study will reveal the best method to adequately fair in the tank and provide a smooth transition for the fan airflow. Fuel-proof the entire engine mount assembly and it is ready to be installed in the can. Make a shim of a strip of poster paper and encircle the ends of the fan blades, centering the fan in the can. Use as many thicknesses as required to insure that the fan will be centered. Now, working from the aft end of the can, check for any shims which may be required between the flow straighteners and the inside of the can. Install the cylinder head on the engine. When satisfied with the location of all components, "paint" the assembly into the can with epoxy thinned with a few drops of dope thinner. Very smooth fillets should result and the thinned epoxy has excellent penetration. Let the unit set over night, pull out the fan shim, check free rotation. When the power package is completed, verify its performance. From scrap shelf stock, available at most lumberyards, build a thrust mount as shown. The two forward mounts support the can assembly and the rear mount supports the tailpipe. Make a tailpipe of light poster paper which fits snugly over the aft end of the can, and which has an exhaust area of 75% of the effective fan area. Effective fan area is defined as the total area based on fan diameter minus hub frontal area. The thrust mount may be mounted on wheels, rollers or in a swinging parallelogram to provide as friction-free an assembly as possible. Run the unit, tying the thrust mount to a small spring scale to measure the thrust. Slice sections from the tailpipe, gradually opening up the exhaust area and thrust check the unit after each adjustment. Use the tailpipe area which generates maximum thrust for the particular fan/ engine combination being used. The ducted fan power package described here was conceived as being interchangeable between several models and suitable for free flight, control line and radio control use. The installation of the unit in the model requires only that the aft edge of the can be a snug slip fit into the forward end of the tailpipe, with the forward portion of the can resting in a suitable cradle, held down by a simple strap or lugs. (1) Reasonable wing area for the size of the aircraft (MIG-21 or F-104 - maybe, U-2 - no question). (2) Reasonably sized tailpipe exit. For scale designs, those aircraft with afterburning engines will provide adequate exhaust area in proportion to the size fan installed. Example: F-100 - good; T-33 - aft fuselage would need modification for tailpipe. (3) Inlet areas should be at least equal to the effective fan area. Some minor considerations to scale are acceptable and, if necessary, auxiliary air inlets can be provided. Example: MIG-15 - adequate as is; F-100 - too small, requires auxiliary inlet. (4) Thrust to weight ratio -1:2 or better is desirable. One of my models has a 1:3 ratio and flies well (6-lb. aircraft - 2-1b. thrust). The ability to thrust-check unit provides weight target. Pressure fuel systems work well and provide consistent operation, but are not necessary, Throttle systems also work well but either an exhaust baffle or intake throttle only is required since very low rpms are not necessary to effectively reduce thrust.